Somewhat an expert in overcoming challenges, Karen finds much of her inspiration through outdoor adventure. She was a keen runner and mountaineer before becoming paralysed in a rock-climbing accident, and has since pursued alternative ways to access the outdoors – canoeing, sit-skiing and hand-cycling. She has hand-cycled in various corners of the world, including Central Asia and the Himalaya, the Karakoram and the length of the Japanese archipelago. Karen has co-organised expeditions sea kayaking along the coastlines of British Columbia and Alaska, skiing across the Greenland icecap, climbing the kilometre-high vertical rock-face of El Capitan, and kayaking through the fjords of Patagonia. As a coach and facilitator, author and speaker, Karen works regularly with young people, schools, businesses and other organisations particularly on the subject of challenge and change. 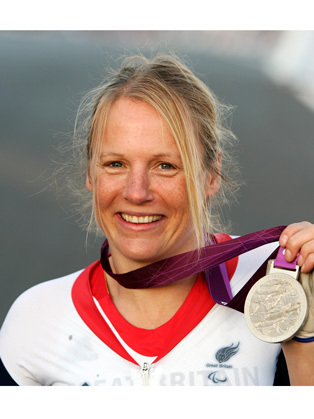 She is currently a full-time athlete with the British Paracycling Team, won a silver medal in the London 2012 Paralympics, was World Paratriathlon Champion in 2012 and silver medallist in 2013, and in 2014 completed an Ironman distance triathlon, the backdrop to the film ‘IMPOSSIBLE’. In Rio 2016, Karen was proud to become Paralympic Champion – a journey of setbacks and a project of belief and the special things that can happen with the coming together of people. Since then she has been selected to represent Scotland at the 2018 Commnowealth Games in Paratriathlon. Her first book “If You Fall” tells the story of her accident; the second, “Boundless” is about her adventures in Greenland and climbing El Capitan. “Quest 79: Find Your Inner Gold” is a collection of short stories positive psychology tips. I just wanted to offer my thanks for delivering what was an excellent speech and one which left myself (and, judging by the comments afterwards, others) feeling in awe, motivated and inspired by your achievements. I wanted to send you a personal note of thanks on behalf of KPMG for the fabulous session you delivered to us yesterday at the British Museum. The feedback was universally outstanding. I personally had a number of takeaways that I will be building into my life. The group was enthralled and inspired (and probably a little dumbstruck by the end of your talk at all your achievements). You are an amazing, strong individual who’s energy, enthusiasm and vision IS an inspiration to all who come into contact with you.